I am a list maker. I love a good list! I have been taking part in the #FAL2016 @finishalong on Instagram by keeping track of the things I want to make each quarter and then blogging about them and registering them on one of the participating host websites to (hopefully) win some prizes! My first quarter list went really well…. Managed to get quite a few of the items on my list done. 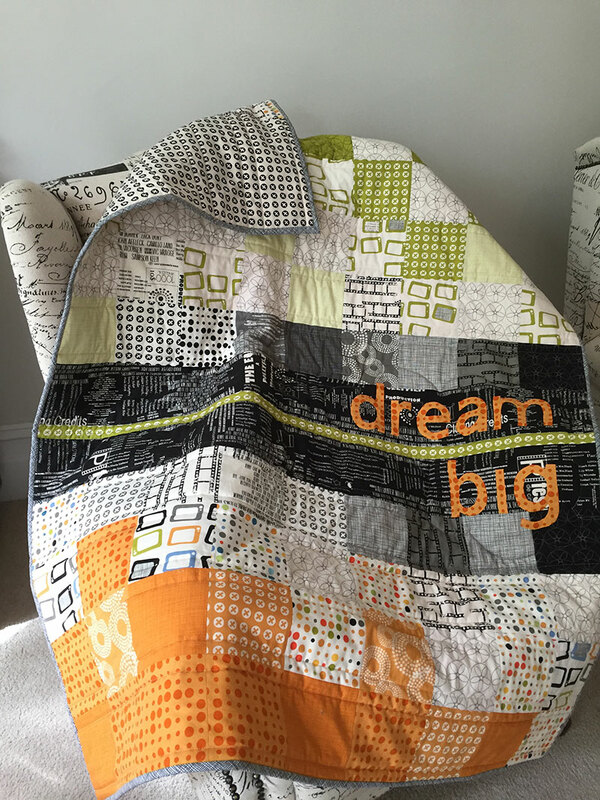 My 'Dream Big' quilt came up really well - just like I envisioned! My second quarter list has been ticking along and I have made a few things that weren’t even originally on my list! But I still have a few things that I would like to complete before the end of June. My hubby finally got more than just some phone socks out of all that fabric I buy! 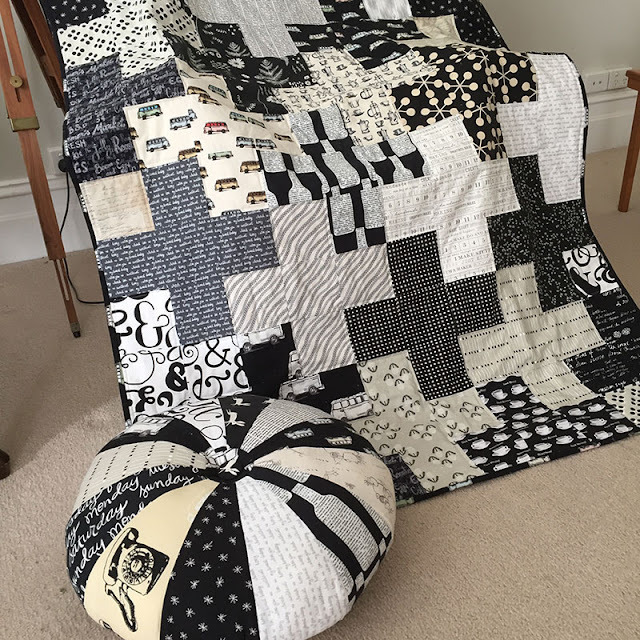 A matching tuffet to go with his B&W Plus Quilt. It is good to keep track of the things I want to make…. There are deadlines like birthdays / special celebrations that I want to make things for and I don’t want to get behind. I hate doing things at the last minute… I seem to spend way too much time reverse sewing if I try to rush! How many works in progress (WIPs) do you have? My oldest WIP is a BOM quilt my mum gave me for my birthday in…. confession time…. 2002. It isn't really my style anymore (not sure it ever really was), but I hate having it sit there mocking me and would like to get it finished! So far this WIP has been through five house moves, three sewing machines and I am onto my second husband! :o Sadly back in the beginning I took for granted that the fabric was cut to the size I needed and I didn’t know the super importance of exact ¼” seams or measuring my blocks. So I have blocks ranging from 16 ½” to 18 ½” inches! And I am at a bit of a loss as to how to put this together without it looking terrible. All suggestions you might have for getting this put together will be gratefully accepted! Well, they look pretty nice in the picture. What about adding different-sized strips of fabric between blocks to make the light parts line up? I don't think that would be terribly noticeable, as long as you make them scrappy. Put another sashing around each block then trim down to all the same size. You could place them all within rows or columns of a width that is wider than your largest block size, add sashing in a consistent color but offsetting blocks rather than attempting to line them up (think wonky log cabin). 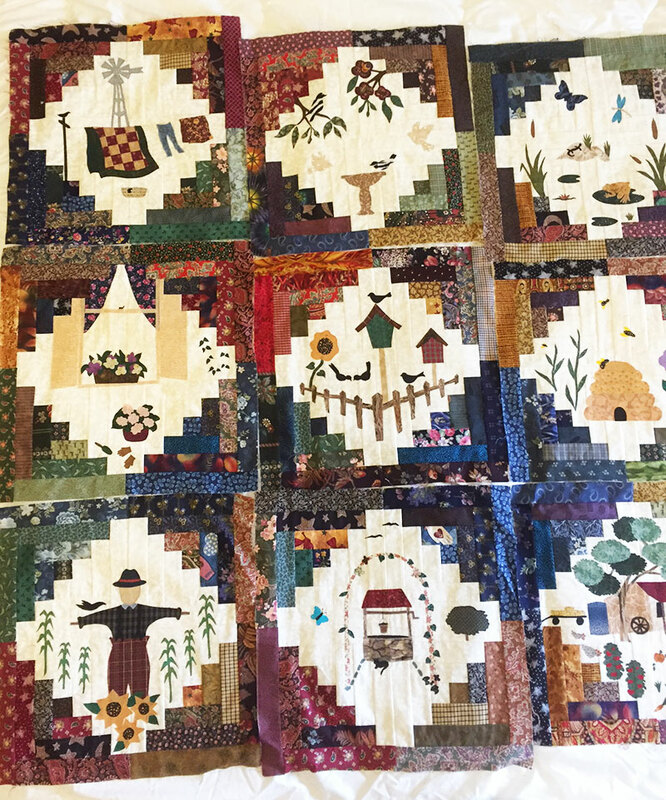 If you used a black sashing, for example, the overall effect might be that the blocks are floating somewhat randomly across the quilt. Traditional meets modern? Another more time-consuming option, which I think may be the same as Fribble's idea, would be to line up the centers and add strips on whichever side is short until you get the block size you want. As long as the white portions line up, the scrappiness of the dark portions should hide the difference in the number of logs.